Looking to send blemishes, dark spots and wrinkles running? There’s a mask for that! Whatever your skin concern, the right corrective formula can put your complexion back on the path to perfection. Correcting acne-prone, oily and combination skin requires careful balance and exfoliation to keep pores clean and trouble free. Clear by CosMedix targets pore-clogging debris with a concentrated mix of salicylic acid—a known blemish-fighting beta hydroxy acid—purifying sulfur, and highly absorbent minerals. Used weekly (more frequently for excessively oily skin), this detoxifying mask can help you achieve the dramatic results you want sooner. As we age, our skin takes longer to turn over. As dead cells build up, they can create a dull, lifeless looking complexion. 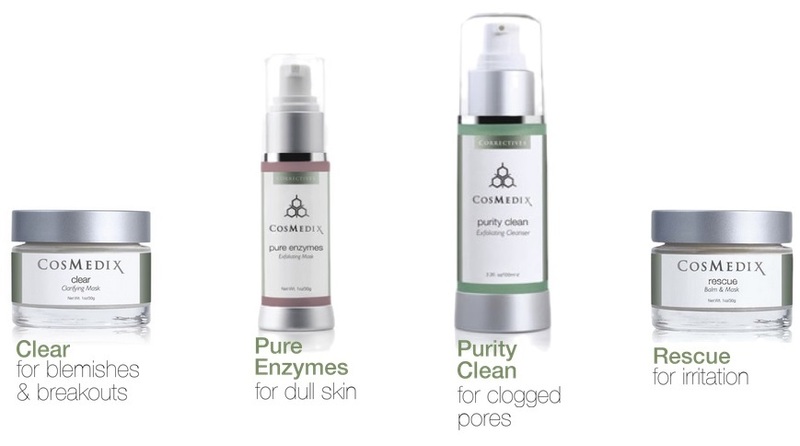 Using an exfoliating mask, such as CosMedix Pure Enzymes, regularly can help. Packed with natural cranberry enzymes and lactic acid—an alpha hydroxy acid commonly found in milk—Pure Enzymes gently melts away dead skin buildup and enhances turnover to help all types of aging skin regain their youthful glow. While deep cleaning is the best way to combat clogged pores, it’s important not to dehydrate the skin in the process. Plant-based cleansers, like Purity Clean, offer a gentle yet highly effective alternative to harsh, moisture-robbing cleansers. Combining lactic acid, tea tree oil, lavender and peppermint, Purity Clean even works as a clarifying mask when applied at full strength for one to three minutes before rinsing. Irritated skin is exceptionally vulnerable to damage and requires a delicate approach to keep things from worsening. Rescue, by CosMedix, offers just the solution. Formulated with shea butter, willow herb and cherry extracts, this all-natural mask works to immediately calm visible signs of irritation—whether from aggressive topical treatments or everyday stress. Which CosMedix mask is your go-to?